Mauricio Santa Cruz sailed Bruschetta to the top of the leader board on day 1 of the Quantum Loop Solutions J/24 World Championship at the Rochester Yacht Club in New York. Ninety-six teams from 12 countries (Argentina, Barbados, Bermuda, Brazil, Canada, Chile, France, Germany, Italy, Japan, Peru and the United States) are participating in the event. Bruschetta scored a 2,6 on Monday for a total of 8 points. Ted Bartlewski’s Drivers Wanted from Canada is five points behind, and Luis Olcese’s Scaramoush from Peru has 16 points. In the day’s first race, Olcese’s Scaramoush claimed the top spot, followed by Santa Cruz’s Bruschetta and Matias Pereira’s Luca from Argentina (the winning boat from the 2011 World Championship). 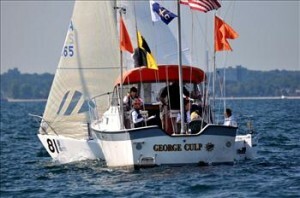 In Race 2, Peter Bream’s Team Tarheel of the USA crossed the finish line first, but suffered a 20% penalty. Vernon Robert’s Joyita of Chile trailed him, and Ignazio Bonanno’s La Superba was third. La Superba appeared to have finished second in Race 1, however they suffered a disqualification. Conditions on Lake Ontario started at 4-6 knots and got as high as 10 knots for a short time in Race 2, then subsided. The conditions then turned very unstable so the Race Committee was not able to complete a third race. 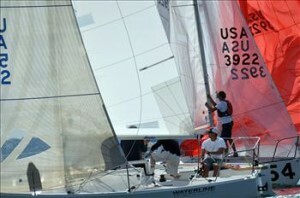 The 2012 J/24 World Championship is title-sponsored by Quantum Loop Solutions and platinum-sponsored by Piehler Land Rover and Jaguar, Shumway Marine, and Miller Coors. The J/24 Class and the Rochester Yacht Club are proud to be partnered with these companies and thank them for their support.